A bump on eyelidappears at the outer edge of the upper or lower eyelid, typically at the place where the lash grows out of the lid. Majority of the eyelid bumps are caused as a result of infection by bacteria or blockage of the oil glands present in the eyelids. Eyelid bumps are usually harmless and they resolve with simple home treatments. However, if the eyelid bump interferes with your normal vision or if the pain increases, it is best to consult a physician. What Causes Bumps on Eyelid? A stye is a result of the staphylococcus bacterial infection of the oil glands present in the eyelids. Staphylococcus is naturally found on the eyelid. Its excessive growth is stimulated by any external or internal factor, leading to infection of the glands producing oil. The infection appears as tender, swollen and red area on the eyelid skin, associated with a tiny white center (pus). Poor hygiene, for instance, using dirty hands to rub your eyes can also lead to eyelid infection. Milia bumps are white, small cysts or bumps that are present on the cheeks, eyelids and nose. They form in clusters or groups. Milia results from accumulation of dead skin cells underneath the skin as the skin is unable to get rid of the skin cells that are dead. Milia bumps form when keratin gets trapped underneath the skin’s surface. The bumps are generally solid and very small. 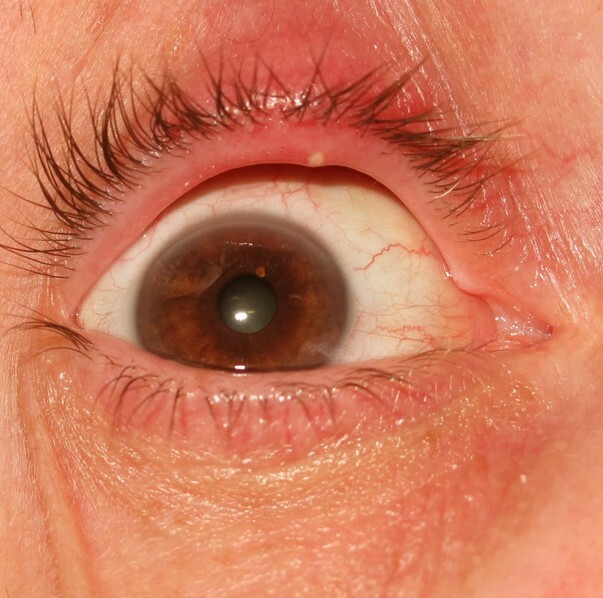 In adults, eyelid trauma and severe sun damage may trigger Milia. A chalazion occurs when an oil gland referred to as a meibomian gland gets swollen and clogged. Meibomian is a type of sebaceous gland that secretes a sticky substance to moisturize the eyelashes, but its duct often gets blocked. This results in the formation of a white bump. A chalazion starts as a small bump that is painful but as it increases in size the pain ceases. The difference between a stye and a chalazion is that the stye is formed due to infection of the oil gland whereas chalazion is formed due to swollen or clogged oil gland. A chalazion also grows to a larger size in some cases up to the size of a pea. When the size of a chalazion becomes too large, it may lead to symptoms of blurred vision or cause obstruction to the eye. 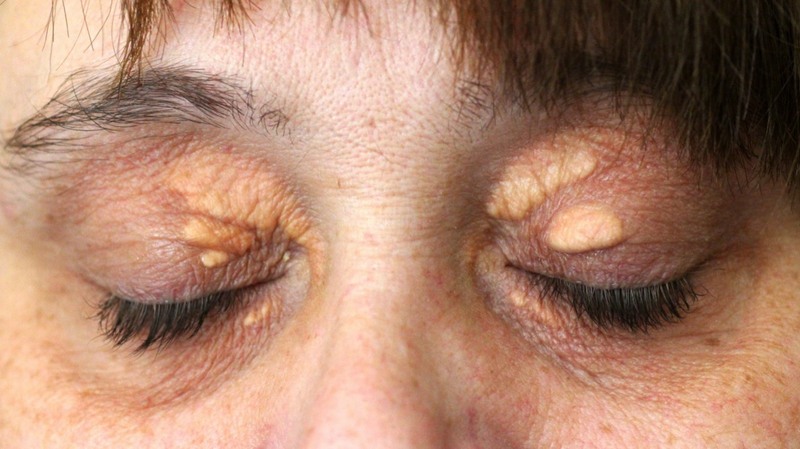 White bumps on the edge of the upper or lower eyelid may occur due to high levels of triglycerides and LDL. They appear as small globs containing white fat beneath the skin. They start as one bump and then become a cluster after a while. 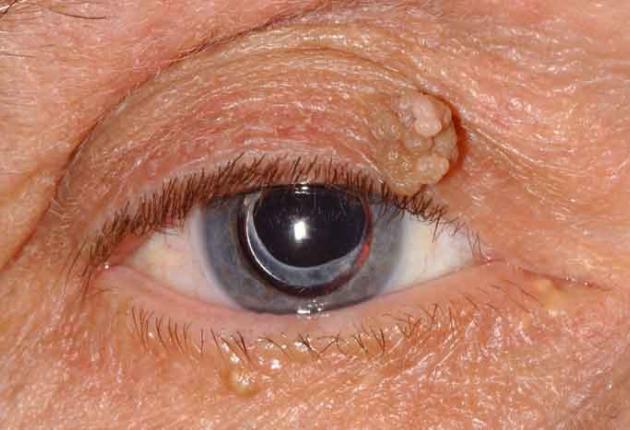 The small bumps on eyelids could be papillomas, due to infection of pailloma virus. They are small and harmless that can form close to the edge of your eyelid. You may need to get them removed either due to cosmetic reasons or if they start interfering with your vision. You can get an eye infection by using contaminated contact lenses. If your eyes are watering continuously, a pimple-like cyst is formed inside the eyelid or pain is felt in the eyes on blinking, then the likely cause is your contact lenses. Contact lenses that are not cleaned properly carry all types of germs such as bacteria. When such contaminated lenses are worn, the bacteria and other germs are introduced in the eyes, leading to infection, which may manifest as various symptoms including small bump on eyelid filled with pus. Expired cosmetics or eye makeup along with using dirty tools to apply makeup can result in an eye infection. 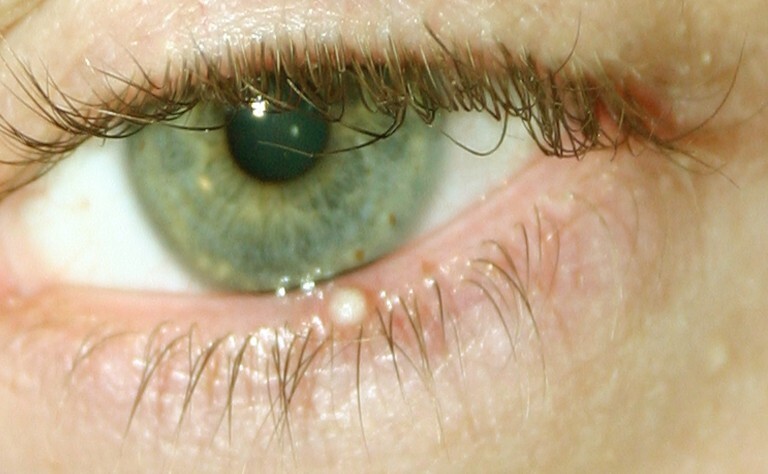 This can cause occurrence of little white cysts on the edge of the eyelids. Moreover, if the pores are clogged by makeup, it may lead to an infected cyst on the edge of the eyelid. Avoid sleeping with eye makeup on as it can clog the pores of your eyelashes. Some persons who had surgery on their upper or lower eyelid referred to as blepharoplasty may develop small, white colored spots or bumps on the eyelid. This growth may occur months or even a year post surgery. The small, white bumps usually form on the incision lines. The bump interferes with your vision. The bump worsens or shows no improvement within a week of self-care. The bump becomes very painful and large. You develop an eyelid blister. You develop scaling or crusting on your eyelids. Your eye or whole eyelid is red. You have excessive watering of eyes or develop sensitivity to light. You have recurrence of stye. You develop bleeding from the bump. Treatment of eyelid bumps depends on the cause. You can try these measures. Maintain good hygiene. Do not rub your eyes with dirty hands. Wash your hands before touching your eyes. Don’t share cosmetics. Don’t use expired cosmetic products. Don’t use makeup on infected eyelid until the infection is fully healed. Clean the eyelids using baby shampoo or gentle soap. Do not squeeze an eyelid bump to drain the pus at home as it may lead to further infection. Do not wear contact lenses until the bump has cleared as wearing them can irritate the eyes and make the infection worse. Rest your eyes during the healing process. Stay away of direct sunlight as it may worsen the condition. If a bump on eyelid does not resolve by home-care, visit your physician; he/she may prescribe medicines to treat the bumps. Your physician may prescribe antibiotic creams for recurrent styes. Persistent and more serious bumps may require surgery.